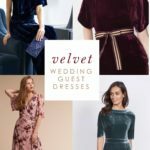 I’m continuing along the spectrum of bridesmaid dresses with the next look on the list – this navy blue bridesmaid dress. I think navy blue will always be a favorite of mine and front-runner in any wedding attire idea because it’s so classic and stately, but it can also be paired with lots of colors for a little added oomph! 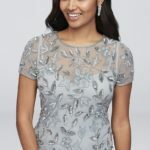 This cap sleeve fit and flare dress appealed to me immediately because of that pretty and flattering shape, the sleeves, and that skinny belt. 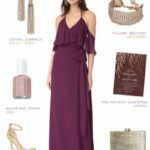 Altogether it’s a perfectly proportioned outfit, and one that any bridesmaid should be happy to wear, in a style that will never be outdated. 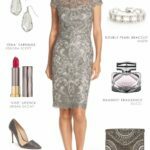 This dress also has definite wear-it-again potential, and can even be a dress to wear to a semi-formal wedding – even if you’re not in it! If you wanted to be completely classic with this look, I’d just put a stand of pearls with this, pearl studs and simple neutral strappy or satin shoes. To give some other options in the same color family, I picked out some navy accessories with a bit of an edge – those gem stud earrings, and the crystal necklace are sweet styles with a bit of modernity, and that blue on blue tie is traditional with just the slightest twist. 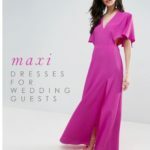 If you’re a fan of this navy in nearly any form like I am, I hope you’ll consider this navy dress as the foundation of a classic wedding guest look or bridesmaid dress for your navy wedding themed wedding. 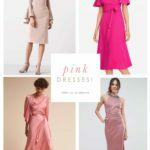 Looking for more navy dresses? 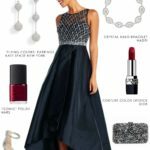 Check out this shoppable navy dress page. Not quite your wedding color? 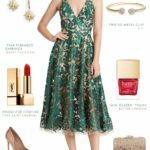 See the previous posts with a light blue dress, green bridesmaid dress, or poppy red! OMG those earrings. Fingers crossed that when I click they’re in my price range!